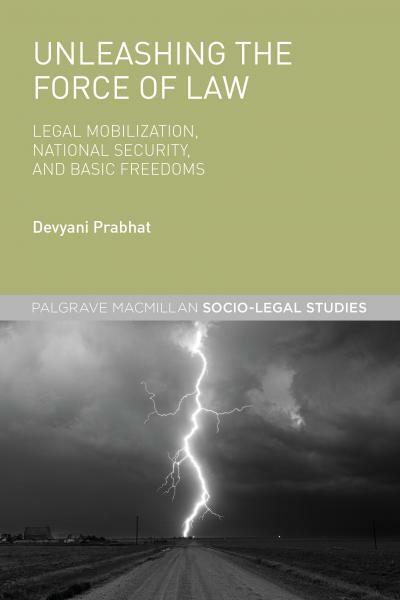 In this blog post, Dr Devyani Prabhat provides the context for her first book Unleashing the Force of Law: Legal Mobilization, National Security, and Basic Freedoms (Palgrave Publishers, 2016), which won the Peter Birks prize of the Society of Legal Scholars (UK and Ireland) for best book in 2017. It was also shortlisted by the Socio-legal Studies Association (SLSA) in 2016 for the best book prize. Dr Prabhat is on Twitter @DrDPrabhat. I start with Auden as it seems fitting both in context and in content. In context, my book, Unleashing the Force of Law, starts each chapter with references to poems. In content, Auden may be referring to a different September in a different decade, but my book originates in the uncannily similar and shocking events of September 11 2001 when New York City became an open graveyard of bodies with the unmentionable odour of death and sorrow everywhere. Emergency laws quickly came into place and suspects were rounded up. Many were detained without access to lawyers or legal process of any sort in Guantánamo Bay, a prison camp in Cuba. Incarceration with no access to due process of law is a familiar pattern of counter-terrorism measures in the backdrop of emotions running high and fear gripping the public imagination. Against this context, there is not much resistance to these state practices. However, lawyers are uniquely positioned to challenge the denial of these rights. Do they, then, rise up against the tide of public and state sentiments to forward such challenges? This is the central query of Unleashing the Force of Law. The book has two main objectives. First, it carries out legal analysis of selected national security cases and, second, it provides socio-legal insights into the role of the legal profession in advancing human rights issues in counter-terrorism cases. Unlike in the past, when criminal defence lawyers seldom mentioned human rights or connected with human rights organisations, the book finds that when lawyers challenge the access to courts, they advance rights based arguments. Why is this so? The examples in the book unveil a bigger picture of the institutionalisation of rights in the US and in the UK in the intervening decades. The book draws on the first set of legal challenges to the holding of prisoners in Guantánamo Bay. At that time, I was a member of the International Human Rights Clinic of New York University School of Law. Soon after, I started my PhD at New York University, and it seemed natural to investigate what spurred on lawyers of different practice areas to challenge collaboratively the use of the prison base in Guantánamo Bay. Drawing on interview and archival data, I examined the role of the New York City based Center for Constitutional Rights (CCR), which spearheaded the Guantánamo legal challenges. CCR had previously represented Haitians held in the immigration detention centres at Guantánamo Bay. Its leaders were progressive lawyers, who had worked on cases for racial justice and against gender discrimination in the 70s and 80s. Back then, they were working at the margins of the profession with few links to large international human rights organisations. In the post 9/11 era, having learnt from the difficulties in the past, the same lawyers decided to reach out across a number of human rights supporters. They were able to mobilise more resources for the court cases from corporate pro bono lawyers, anti-death penalty lawyers and international human rights organisations like Amnesty International and Human Rights Watch. The first legal challenge against Guantánamo Bay concerned a British citizen, Shafiq Rasul, in Rasul v. Bush, 542 U.S. 466 (2004), and was brought against the courts by a group of anti-death penalty American lawyers who also had connections with the London-based legal NGO, Reprieve; thus facilitating the transatlantic sharing of legal strategies and ideas from the early days of the Guantánamo litigations. Following this transnational trail Unleashing the Force of Law also examines legal practice in London and Belfast to see how rights dimensions enter counter-terrorism cases in the UK as well. The book paints a complex picture of lawyers, who participate in rights work in times of turmoil and explains why they do so. The findings suggest that in the UK, the Human Rights Act has spawned a new generation of human rights specialist lawyers who have increasingly acquired technical expertise and can represent unpopular clients. In the past, more radical arguments about anti-colonialism and imperialism were advanced in court, but these were deeply unpopular in both the US and the UK. For instance, when US imperialism over Puerto Rico was argued in court by Puerto Rican nationalists in the 1980s they were sentenced to prison for decades for ‘seditious conspiracy’. The most noteworthy nationalist, Oscar López Rivera, was released in 2017 after 36 years in custody despite having caused no actual deaths or injuries by his actions. Unlike in the past, there is, arguably, greater personal safety for lawyers today. However, legal challenges have largely left untouched the new ‘emergency’ procedures developed in the post 9/11 era such as secret courts and tribunals. In the US context, Guantánamo Bay prison remains open, despite the concerted efforts of diverse lawyers: corporate pro bono counsels, anti-death penalty litigators and international human rights organisations who collaborate with law clinics of major universities. Thus, the book sounds a note of caution about relying solely on the formal structure of law and legal challenges to put forward rights claims. As emergencies continue for extended periods, the very nature of legal practice changes to accommodate secret trials. This normalisation of emergency procedures for extended periods needs to be challenged as a whole through democratic political processes, rather than in a piecemeal manner in courts. Until then, the force of law to safeguard access to courts is not unleashed and state impunity continues. Therefore, the rule of law cannot ever be taken for granted. To return to Auden who compares law to love and emphasises its fragility, ‘Law.. Like love we seldom keep.’ Without the struggle, the rule of law will be lost. * This post was first published in the Border Criminologies blog and is reproduced with thanks.